Two major hurricanes hurricanes in 1998, Georges and Mitch, caused death, destruction and untold human suffering in several nations around the Caribbean basin. Georges started as a tropical depression near the Cape Verde islands, off the coast of equatorial Africa on 15 September 1998, it became a tropical storm the next day and a hurricane on the 17th. Two days later this tropical cyclone turned into a major hurricane as it approached the Lesser Antilles. Eventually hurricane georges directly impacted the Virgin islands, Puerto Rico, Dominican republic, Haiti, Cuba and the states of Mississippi, Alabama and Florida. The worst impact and highest death toll from Georges were in the Dominican Republic and Haiti where wind, heavy rain, flash floods and failures in the local emergency management structure lead to major disasters in both countries. Tropical Cyclone Mitch became one of the strongest hurricans of record in the larger North Atlantic basin when it developed as a tropical depression ion 22 October 1998, became a tropical storm on the 23rd and grew into a hurricane within a few hours the same day, reaching major hurricane strength on 24 October reaching category 5 and the lowest central pressure of record (at the time) at 905 milibars early on 26 October. 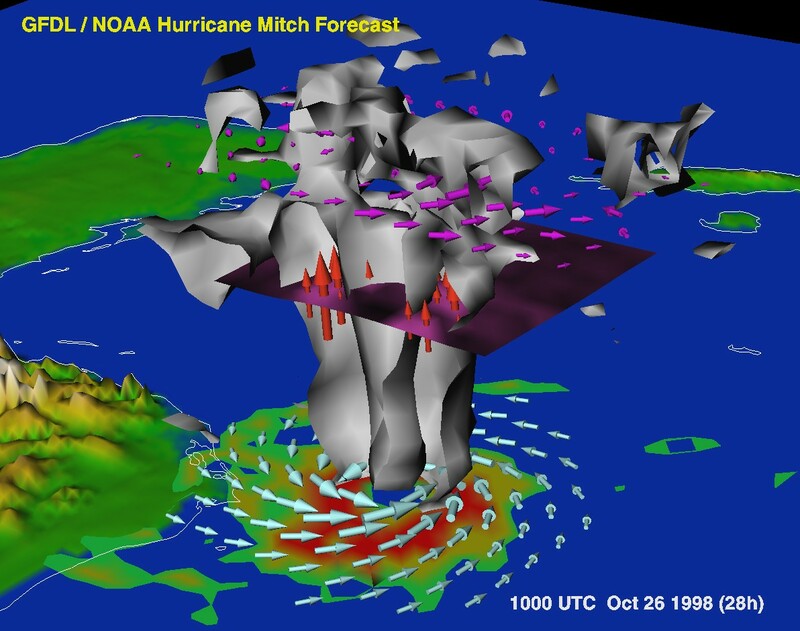 After such meteoric rise and record-breaking development into a major hurricane Mitch stalled and meandered for a couple of days near the coast of Honduras until finally making landfall as a minor hurricane on the 29th, after which it lost strength becoming a tropical depression and then briefly a tropical storm again and back to a depression as it traversed Honduras, Guatemala, the Bay of Campeche, a portion of the Yucatan peninsula to then make landfall in Florida on 4 November progressing on to the Atlantic on November 5 until it dissipated near Iceland on November 9, 1998. From this we can see that Mitch was a long lived tropical cyclone, one of the strongest major hurricanes of record, which caused large numbers of casualties in Honduras, Nicaragua, El Salvador and Guatemala mainly as a result of catastrophic flooding, especially in Honduras. In Nicargua, where Mitch did not even make landfall, the interaction of the cyclone with mountains generated extreme amounts of rain leading to a major land and mudslide on the Casitas volcano, which caused a ‘disaster within a disaster’ and an additional 1,800 dead in that country. Following these catastrophic impacts Ricardo Alvarez together with Richard Olson of FIU and others conducted field work and research in all the affected countries docusing on how the local civil defense structures had performed in each case. 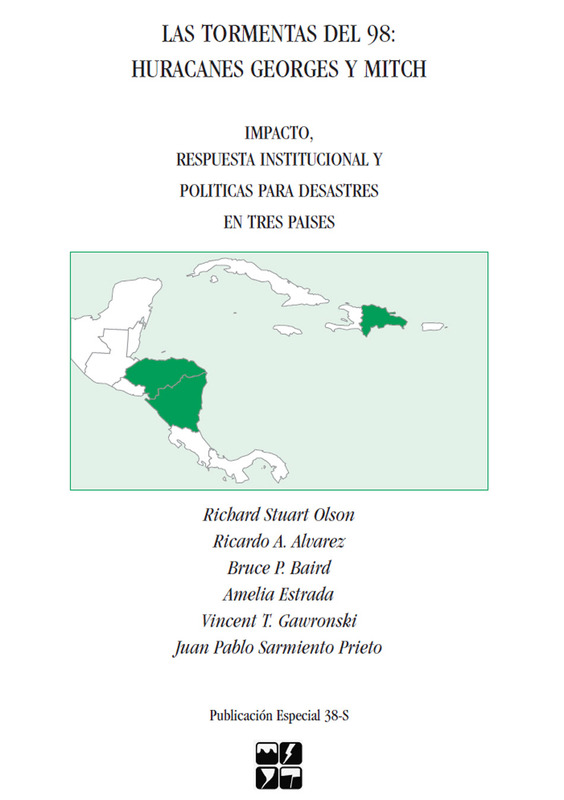 The results of this work were published as Special Publication #38 by the Natural Hazards Center under the title The Storms of ’98: Hurricanes Georges and Mitch – Impacts, Instituions Response, and Disaster Politics in Three Countries. ( you can read this publication by clicking on the link that follows TheStormsof98HurricaneGeorgesandMitch) This volume was later also published in Spanish as Special Publication #38-S.
Keep visitting this page as the Spanish version of the publication will also be posted in the near future.